In recent months, I've been reflecting a lot on how spoiled we are as a society. A car in the driveway for every one over 16. Phones for every member of the family. I could go on and on. After watching the news coverage before, during and after the arrival of Hurricane Sandy, I've been reflecting on the many things for which I am so very thankful. It's helped me realize what's really matters and what does not. I've often complained that I'm using the same basic cell phone for the past (almost) 4 years when I'd much rather have an iPhone or equivalent smart phone. This week, I've been very thankful for that "ancient" cell phone, when so many were without phones during the storm (some are still having trouble with service). Or, I've wished we could afford to replace our beat-up and very uncomfortable living room furniture that is nearly 18 years old! This week, I'm so thankful for this lumpy, bumpy sofa and grateful that we're not sleeping in a cot in a shelter or sleeping bag on our families' living room floor. All of this (and much more) has been weighing on my mind and my heart the past few days. 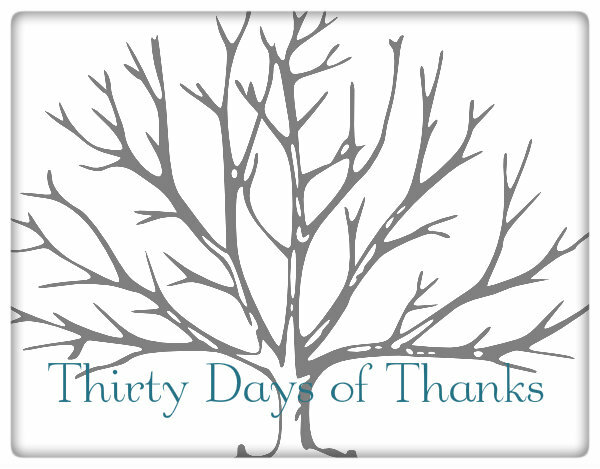 During the next 30 days (I'm going to try very hard to post daily), I will share something that I am thankful for and will invite you to join me by sharing your reasons to be thankful in the comments section of the post. Today, I am so very thankful that we were not hard hit by Hurricane Sandy. Our trees are still standing, we didn't lose power and we are able to provide hot showers for family members that weren't so lucky. If you would like to join in, please share what you are thankful for in the comments section of this post. That is awesome that you are doing this!!! I am so thankful we've not been hit by the Hurricane and that my family has a warm home to stay in. So much to be thankful for! I am thankful you were not hit hard either! Everyone I hear who was spared, I give thanks! It is so good to be genuinely thankful for anything and everything, but it's hard in our society. Thanks for this reminder! Awesome! 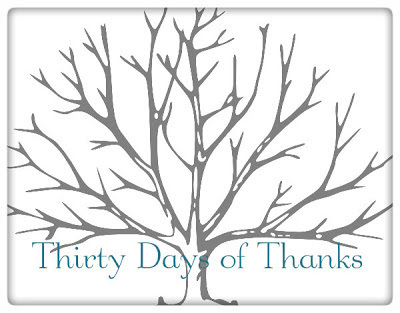 I do 30 Days of Gratitude every November as well. Look forward to reading your posts over the next month. I'm thankful that we were spared from Sandy as well! Glad to hear you and yours are okay!